Nolan is now a seasoned Jet traveler. He knows how to relax and people watch in the Airport. When the crowds clear, he plays fetch in the baggage claim. We have learned that the direct flight from Minneapolis to Anchorage is the best bet. 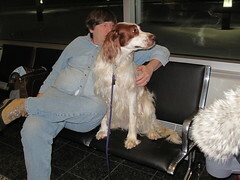 We plan a long layover in Anchorage to walk the dog and check in again. We were very happy that Nolan to puts up with the travel in good spirits. I actually think he has more room than I did in the middle seat for 5 hours. The rewards were worth it. Nolan got to play with tons of dogs on the trip and run around on farms and in our big woods.